MHS freshman Mallory Hawley (14) attempts a spike during the Lady Marauders setback against Wellston on Tuesday in Rocksprings, Ohio. ROCKSPRINGS, Ohio — Down to the wire. 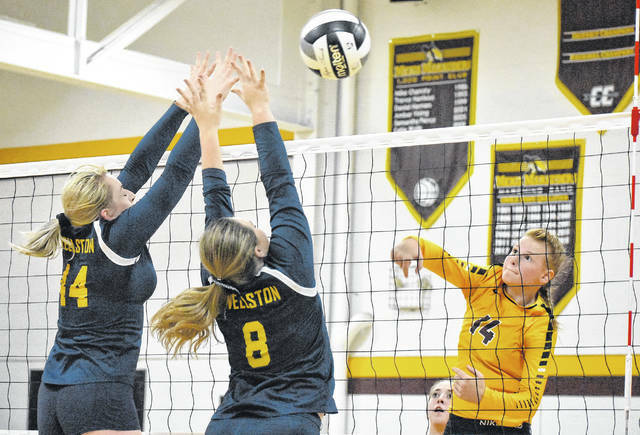 The Meigs volleyball team battled with the visiting Lady Golden Rockets through five games in Tuesday night’s Tri Valley Conference Ohio Division match, with the Lady Marauders suffering a 17-15 loss in the deciding set as Wellston earned a 3-2 match victory in Meigs County. The Maroon and Gold (3-7, 0-4 TVC Ohio) jumped to an early lead in the opening game, as they pulled out to a 12-6 advantage en route to a 25-7 win. After 10 ties in the second game, Wellston (4-6, 1-4) appeared poised to fall behind 2-0 in the contest as MHS pulled ahead at 24-23. The Blue and Gold rallied however to tie the match at 24-24, before closing out the game with a 26-24 victory. The third game was heavily in favor of the Lady Marauders as they jumped to a 9-1 advantage en route to a 25-9 victory. The fourth game was tightly contested, as Meigs leaped to a 7-3 lead, but the Lady Golden Rockets rallied to knot the game at 9-9. Wellston, however, outscored MHS 16-11 to close out the 25-20 to force a fifth and deciding set. In the deciding game, Meigs jumped out to an early 4-1 advantage, but Wellston closed within a point at 4-3. The Lady Marauders utilized an 8-6 scoring run to pull ahead at 12-9, however, the Lady Golden Rockets rallied to knot the game at 12-12. The two squads would remain in a see-saw battle until Meigs took a 14-13 advantage and move to match-point, but WHS outscored the hosts 4-1 to close out a 17-15 win in the finale and 3-2 match victory. The Lady Marauders service attack was led by Maci Hood with 16 points, including two aces, while Maddie Fields followed with 11 points. Baylee Tracy posted nine points, while Mallory Hawley was next with seven points. Hannah Durst followed with five service points, including one ace, as Marissa Noble closed out the MHS service attack with four points. 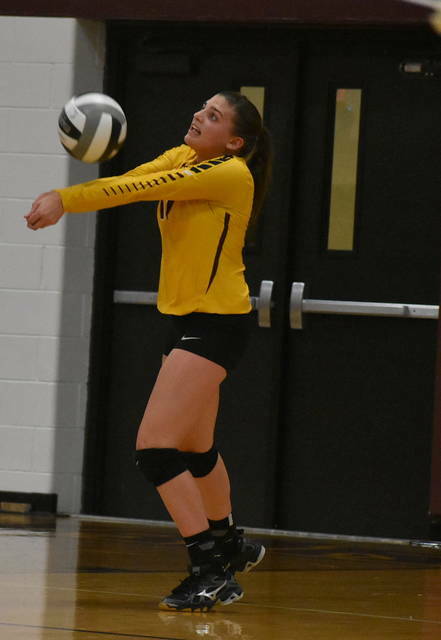 As a team Meigs finished with 48 kills, three aces, 18 blocks and 125 digs. The Lady Golden Rockets service attack was led by Sadie Henry with nine points, while Shai Brandau and Molly Smith each followed with seven points apiece, respectively. Kamryn Karr posted six points, while Madison Mullins was next with five points. Sydney Mullins followed with three points, as Nevaeh Ousley rounded out the Blue and Gold service attack with one point. The Maroon and Gold will have an opportunity to avenge this setback on Oct. 11 in Wellston. Meigs will resume league play on Thursday at Vinton County.